Eastern tent caterpillars bask in the sun together. Homeowners worried about their prized cherry trees may not be happy to see silk tents appear in the branches each spring. 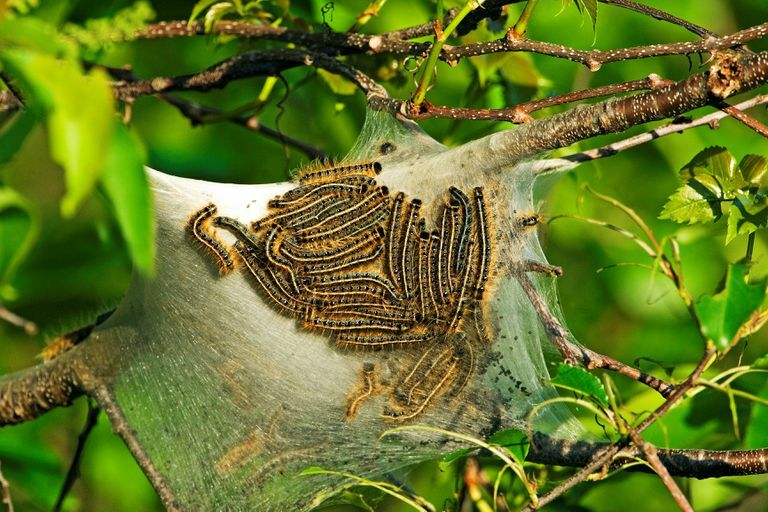 In large numbers, tent caterpillars can devour nearly every leaf on a tree. But take a few moments to observe the tent caterpillars in action, and you'll soon discover they are remarkably sophisticated insects. These 10 fascinating facts about tent caterpillars may change your opinion of these common pests. It's no coincidence that dozens of tent caterpillars camp out together in a communal silk tent. Tent caterpillars are highly social beings! Within the genus Malacosoma, there are 26 known species of tent caterpillars, and all of them exhibit social behaviors. The female moth deposits 150-250 eggs in a single mass, often on the south side of a cherry tree branch. For the 6-8 weeks they are caterpillars, these siblings will live and feed and grow together. Not all Malacosoma caterpillars build large, permanent tents, but those that do use their family tent as a base of operations throughout the larval life stage. Eastern tent caterpillars begin their lives by choosing a location to build their home. The tiny caterpillars look for a tree crotch that receives morning sun, and then each spins silk to contribute to their tent's construction. Early instar caterpillars only require a small tent, but as they grow, they expand their tent to accommodate their larger size. Before each foraging trip, the caterpillars mend and maintain their home. Between meals, the tent serves as a resting place, where the caterpillars are afforded some protection from predators. Many insects use chemical markers to communicate. Eastern tent caterpillars leave pheromone trails to signal their siblings, and they do so in a fairly sophisticated way. 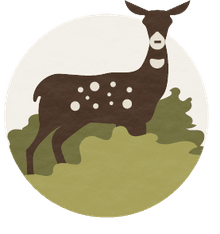 They use different pheromones to mark exploratory trails and recruitment trails. When a wandering caterpillar encounters an exploratory pheromone trail, it knows another caterpillar is already surveying that branch for food and turns in another direction. If a caterpillar locates a branch flush with leaves, it signals to others to join the meal using its recruitment pheromone. If you spend enough time observing eastern tent caterpillars, you'll notice a caterpillar stops and "sniffs" when it comes to the crotch of a tree branch, trying to determine which way to go. Eastern tent caterpillars are active in the ​spring, when warm weather hasn't quite taken hold. Temperatures may fluctuate, and nights can be downright cold. Eastern tent caterpillars practice behavioral thermoregulation, taking active steps together to control their body temperature. If they need to warm up, eastern tent caterpillars may bask in the sun on the outside of their tent. Usually, they'll huddle together in tight clusters, to minimize the impact of the wind. If it gets really cold, the eastern tent caterpillars hunker down in their silk tent together. The tent is constructed in layers, which allows them to move from level to level as the temperature requires. Conversely, if it gets too warm in the tent, the caterpillars will move to the shady side and suspend themselves separately, to allow air to circulate between them. Grazing mares can easily ingest eastern tent caterpillars in the spring, and that spells trouble for horse owners. Although generally harmless, eastern tent caterpillars are covered in tiny hairs called setae that can penetrate the walls of a mare's digestive tract, including its intestines. This can introduce bacteria into the horse's reproductive organs, and even the amniotic sac. After eating eastern tent caterpillars, pregnant mares may spontaneously abort their late-term fetuses, a condition known as mare reproductive loss syndrome (MRLS). During years when tent caterpillar numbers are high, foal losses can be significant. In 2001, Kentucky horse owners lost over one-third of their foal fetuses to MRLS. And MRLS doesn't just affect horses. Mules and donkeys can also abort their developing young after ingesting tent caterpillars. Our Malacosoma tent caterpillars are native forest pests, and despite their voracious appetites, our forest trees can usually recover from the damage they inflict. Some years are definitely worse than others for tent caterpillar infestations. Every 9-16 years, the tent caterpillar populations reach a peak that causes significant damage to trees. Fortunately, these trends are cyclical, so after a particularly heavy infestation year, we typically see a decline in tent caterpillar numbers. If you're favorite cherry or apple tree took a hit this year, don't panic. Next year shouldn't be quite so bad. "Horse owners should watch for eastern tent caterpillar, " University of Missouri extension, May 17, 2013. Accessed online August 15, 2017. "Tent Caterpillars, Malacsoma spp.," by Terrence D. Fitzgerald, Encyclopedia of Entomology, 2nd edition, John L. Capinera. What Are Some Fascinating Facts About Painted Lady Butterflies?